I don’t much like politics. Dems are Big Government and Repubs are Big Business and we could all do with a little less of both. But with as polarizing as election time always is, it is natural for some curiosity to rub off, and as I unfortunately found myself listening to NPR one day and hearing about this book, I bit. Right off the bat I will say that this is a pro-Democrat book, with perhaps a moderate instead of a liberal slant. Who Stole the American Dream? really resonates with me because it touches on all the creeping doubts I had with the modern establishment but could never intellectually voice. Corporate power and the use of stock price as a measuring stick of success, the influence of Wall Street in political power, the overpay of CEOs and the richest 1%- these are all problems that feel evil to the everyman and spawned the entire Occupy Wall Street movement. If you’ve ever found yourself at odds with any of these agendas then I’d recommend reading this book as it goes into detail with why these are bad trends and what changes in history led to this status quo. "Two trends are primarily responsible for today’s hyperconcentration of wealth in America- the collective decisions over time by America’s corporate power elite to take a far bigger share of business earnings for themselves, and the increasingly pro-rich, pro-business policy tilt in Washington since the late 1970s." 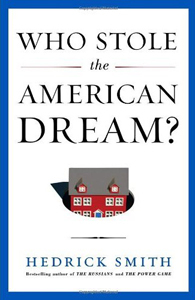 At its core, Who Stole the American Dream? is simply a comparison between the success of the middle class in the 50s, 60, and 70s, compared to the turnaround in the 80s, 90s, and 00s. The middle class was strong and felt well represented in politics during multiple civil rights movements. In time, the balance of power shifted away from the individual and to the corporations who are less regulated than ever before. Tax advantages for the rich have improved dramatically over this time period. The author asserts that a series of greedy policy changes have led this country into the current depression and caused a Middle Class Squeeze, an enormous loss of wealth for the 80%. "Exhibit number one showing that there is no direct link between low taxes and high growth was America’s dismal economic record following the massive tax cuts enacted under George W. Bush in 2001, 2002, and 2003." The book attempts to present its facts in a mostly non-partisan format but at times does pick on Republicans a bit. Perhaps that is merely pointing out the problem as the party has been very pro-business of late. Combined with the fact that the opening prologue is very preachy and full of rhetoric, I could see it rubbing some people the wrong way. Also, this is a long book and some of the chapters nearer the end feel like excess bloat. A better editor with a smarter outline format would’ve done wonders with this publication. However, these faults aside, the real meat of the matter lies through the 10%-60% marks of the book and this should be enough to enlighten and enrage most casual readers. "Our nation’s system of retirement security is imperiled, headed for a serious train wreck." As to issues that I either disagree with or otherwise do not see eye to eye on, the author puts his full support behind unions and pensions. I am not one to think that unions need to be forced on workers or that 401ks are worse than pensions but I do admit to some pause after being more educated on the topics. Much of the anti-401k talk references older mismanaged plans and in this day and age one should never think of old fashioned pensions as a sure thing anyway. Still, the point is well taken that over the last 50 years employers have found ways to remove themselves from retirement responsibility, and while we may question where this responsibility should lie, it is nevertheless another benefit that has been lost to the middle class. "The growth of these pyramiding bank loans and derivatives followed the policy prescriptions of Fed chairman Alan Greenspan, who credited this process with diversifying risk and having "contributed to the stability of the banking system…."" I don’t hold as much sympathy for ‘swindled home owners’ as most liberals do. Taking money from your own equity sounds like a bad idea upon immediate consideration and there needs to be some accountability of the home owners. They were, after all, written checks that they spent elsewhere. But again I welcomed the differing viewpoint, explained so strongly and convincingly that I have softened my stance. It is admittedly hard to make the correct decisions when the majority of financial experts and banking institutions are acting greedily, and the sheer amount of fraud that was happening opened my eyes. If you want a detailed narrative of the housing bubble, look no further. "In this era of globalization, the interests of companies and countries have diverged." As far as new causes to champion, this quote hits the nail on the head. Free Market is the wrong phrase- the focus needs to be the Free American Market. In a truly global free market, it makes complete sense to screw the American economy over to build gains, even for American companies. Our government isn’t set up to promote truly free and blindly equal capitalism, it is set up to protect our country. Sometimes that means forcing corporations to ‘stay home’ and treat Americans fairly even when technically not in their best personal interests. I don’t advocate unfair practices and taking advantage of other countries, and today’s world would better police itself against this, but I do think we should give tax breaks to the companies that are helping our economy as opposed to those helping build China. "Powerlessness breeds cynicism and passivism, especially between elections, which is the crucial time when policies are forged, the time when the organized money of special interests exerts commanding influence." Overall, Who Stole the American Dream? is a call to arms, a cry to make your voice heard. It is a narrative that is meant to outrage the middle class and is backed by many factual examples and citations with a healthy does of rhetoric and zeal. The book ends with several points to a solution but there aren’t any easy answers here. The power of the business lobby dwarfs anything else in Washington and that isn’t likely to change soon. But the knowledge of the countless problems provide some comfort, and if you were inclined to try and do something about them, this book would be a good launching point.